The Face of Grief – four performances and a Radio 3 broadcast, all within a month! 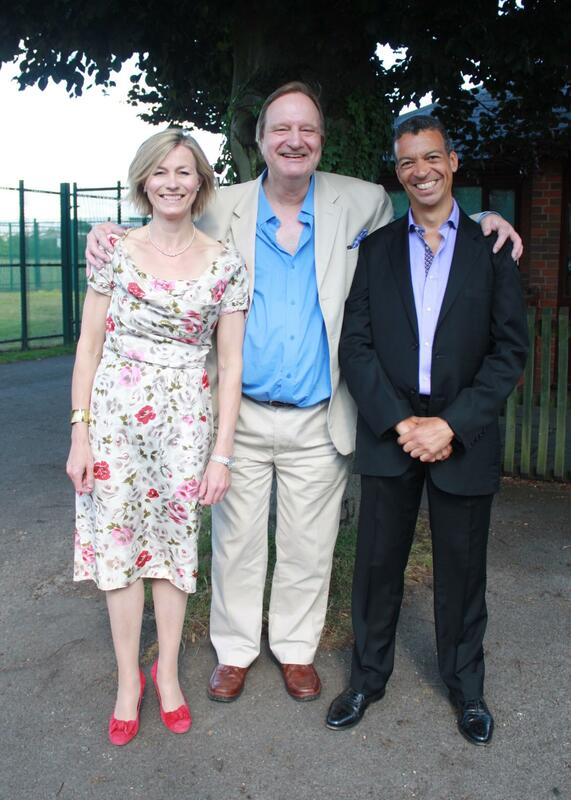 Susie Allan, Tim Torry and Roderick Williams after the Three Choirs performance, outside the Holy Trinity Church, Hereford. Alex has asked me to give my own account of, what was for me, the exciting month of July 2015, during which I had a whale of a time following performances of my music round the country! It all stemmed from my going to a recital at the beautiful venue of Holkham Hall in the summer of 2012, a recital to which my brother, Nick, alerted me, as he subscribed to the music society which was putting the recital on. This wonderful recital was given by Roderick Williams (baritone) – whom Nick knew that I greatly admired – and Susie Allan (piano) – and I went prepared! I was able, after the recital, to have a delightful conversation with Roddy (as he is known) and give him a pile of my songs, which he assured me he would look at, whilst saying that it may take a while, as he was – understandably – often sent scores. I had included, at the last moment, a copy of The Face of Grief (Three War poems of Charlotte Mew), in its original soprano and piano version (which the splendid soprano Lindsay Gowers had already performed twice at C.N.M. events), to see whether it might interest him. Having heard nothing for a couple of years, I decided to try and contact him via his agents, who were kind enough to send on my e-mail to him straight away. As it turned out, he was perfectly happy to have been ‘nudged’, as his list of things to do is, of course, a long one! By then – with the imminence of the inevitable 1st World War commemorations – I had devised a version of The Face of Grief for baritone and piano (as well as one with orchestra) and the resulting e-mail conversation I had with Roddy resulted in my sending him copies of both versions, as he agreed that now was the time to try and get it performed, although he explained that it may take a year or two to organise, as the relevant impresarios often needed some convincing about the inclusion of new pieces. So it was very much to my surprise and delight when he e-mailed me a few weeks later, telling me that he intended to include the piece in his Summer Recital Series and that there might be a possibility of a broadcast! Dreamland, then! The upshot of all this was that he and Susie Allan gave four (yes, four!) recital performances at festivals during July, at Buxton, Llandeilo, Budleigh Salterton and – as the icing on the cake – on the opening day of the 300th Anniversary Three Choirs Festival at Holy Trinity Church in Hereford (not in the Cathedral and not as a large-scale choral work especially requested, as a recent newspaper article and dominating photo implied! Wouldn’t that be nice?!). My railway journeys round all four of these venues were utterly delightful (not least, despite the rain, that on the ‘Heart of Wales’ line, featured on TV earlier this year by Michael Portillo). All four performances were sold out and the audience response in each case was warmly enthusiastic, with a good number of individual audience-members making a point of coming up to me afterwards and expressing their personal thanks for the piece, often with educated comments on it. Needless to say, all four recitals – with varied content, but each containing the well-thought-out theme of ‘those left behind’ during the 1st World War – were absolutely superb in every respect, given as they were by two world class performers and included the surprising, but entirely convincing, spectacle of a baritone’s singing a hitherto almost-exclusively contralto/mezzo piece, Elgar’s gorgeous Sea Pictures! I shall get the score! As well as equally lovely repertoire by Vaughan Williams (Four last Songs), Howells (especially his cheeky Girl’s Song!) and Butterworth (the lesser-known but at least as good Bredon Hill songs), other living composers represented were the self-effacing Nicholas Marshall – who makes a splendid job of organising the Budleigh Festival and of whose delicious Slumber Song I now proudly have a copy – and Brian Inglis, whose exuberant setting of Sassoon’s Everyone Sang has a both a far from easy vocal line and very tricky piano part, expertly negotiated -as always – by the wonderful Susie Allan, as was the case with both the Elgar and the long and varied piano part (at one strategic point including Stockhausenesque hand-clusters!) of the Three Choirs commissionee, Rhian Samuel’s impressive cycle A Swift Radiant Morning – a very demanding sing indeed, too! Oh, and Philip Venables’ 60th birthday encore at Hereford (not broadcast, unfortunately) – a short and wittily delivered song of his simply called Hippo – rightly brought the house down! Some of you may well have experienced Roddy’s extraordinary vocal and communicative skills (his diction is also an object lesson in clarity and subtlety), for example in last year’s televised Proms. He was the charismatic soloist on ‘The Last Night’, as well as earlier giving a mesmeric performance of Butterworth’s beautiful A Shropshire Lad cycle, in a version with orchestra. Recently he also took part in ‘Proms Extra’, as he also did last year – and he really is as nice and as unaffected a chap as he appears, by the way! Indeed, I had the great pleasure of being booked in to the same hotel in Llandeilo as Roddy and Susie – as well as Roddy’s delightful wife and fifteen-year-old son – and so was able to spend a fair bit of social time with them all, as well as sitting in on most of the rehearsal sessions at each festival, a most valuable experience in itself for a rather less elevated baritone soloist such as me. I had, in fact included the first of my Face of Grief songs in my recital of English Music with the excellent Peter Dollimore at Long Melford Church in June, so I was able to let the audience of 85 or so members know of the complete performances coming up, as well as the broadcast (by then confirmed)! While at Llandeilo’s excellent Cawdor Hotel (for which, kindly, the Festival footed my bill), I was also privileged to meet the splendid young pianist Tom Poster, as well as his recital partner, the great Steven Isserlis, who – in the quarter-of-an-hour or so during which I was in his company – revealed himself to be just as much of a ‘character’ as he had appeared to be at a distance! I’ll resist the temptation of revealing his entertaining tale of an early ‘Music Club’ experience which he dramatically, but gleefully divulged with a look of utter shock on his face. Other than saying that I hope that some of my insights gained from this whole adventure may be of some help to other C.N.M. members, all that remains is for me to acknowledge the great debt which I owe both Roddy and Susie for their ideally impeccable, subtle and atmospheric performances of my songs, as witness the BBC recording that was kindly provided for me, although – as with the broadcast itself – it was seen fit to edit out about ten or more seconds of ‘pin-drop’ atmospheric silence at the end, making it sound as though the audience just couldn’t wait to burst into applause! Actually, I may be biased, but I have to say that they couldn’t, but only after the pin-drop’ silence! As a postscript to all this, I received a message via Linkedin the day after the broadcast from a promising young Australian baritone called Michael Lampard – who had caught the broadcast on line – saying, ‘It was wonderful. How does one go about getting the music…’, as a result of which I sent him a copy via a Sibelius attachment, as well as copy of my setting of Housman’s Loveliest of Trees, to which he replied, ‘What a nice setting…’. It turned out that he had been in contact with Roddy for a few years, after he had met him in Melbourne and was particularly interested in English Song. So maybe there will be an Australian première in due course, who knows. I was also very happy to be interviewed by Mr Tom King for the Colchester Gazette’s and County Standard’s recent ‘spreads’, but I hope that my own account will have helped to iron out a few anomalies resulting from the editing process, although the reason for my holding my car keys with such apparent great significance in the photo that was published will have been lost on most readers. In fact it was to do with my use of them as a dowsing device, about which explanatory information was omitted from the final script, puzzling Tom King somewhat, who also took alternative pictures – which could just as easily have been used – of me peering at my score! However, human error is forgivable, ‘All publicity is good publicity’ (so they say) and there was at least nothing too damning included in the article, as far as I could see! We hope to add a link to a recording of one of these performances in due course. This entry was posted in Articles, Broadcasts, Concerts, member news and tagged BBC Radio 3, Budleigh Festival, Buxton Festival, Llandeilo Festival, Roderick Williams, Susie Allan, Three Choirs Festival, tim torry on September 9, 2015 by AlexanderBlustin. I record all the R3 Lunchtime Concerts and listen in the evenings. As you may recall, I rarely listen to solo voice, but I am fond of settings of the War Poets. I just heard your setting of The Face of Grief on R3 Lunchtime Concert today, from Holy Trinity Church at last year’s TCF. I heard the announcer say “Torry”, looked it up, and there you were !! So total serendipity In fact. A beautifully recorded performance of your fine setting. By the way, six years ago, I married Cath who you perhaps recall meeting at one of the CRGS garden parties. You’ll be tickled to hear that she is also a Mew, but apparently unrelated !! Lovely to hear from you, Norm – and to have your lovely comments! Glad you liked it. I was very fortunate that Roderick Williams (or Roddy, as he’s widely known) took my piece up – four performances and a broadcast in a month, a real luxury. And now a repeat broadcast! The Mew connection is a remarkable coincidence indeed. Belated congratulations on your marriage, by the way!! If you like, you can find access to more details on my Facebook and Linkedin pages. It would be nice to keep in touch. are you still local? No longer local I’m afraid … we moved to E Sussex to be near Cath’s grandchildren. Cath sometimes visits Eileen Ruxton, and we have occasionally bumped into Jan on our travels, but we’ve not been in Colchester for quite a while. We still dance the morris. Our local side is Ditchling, and we’re off to Devizes with them this w/end. Shame about the weather !! Also we have strong ties with Baldock, and an occasional Sheringham side and an occasional Malvern side, so we get about. Heh heh … no more union work for me since 2009 thank goodness … teaching is in a terrible state by all accounts. We both got out at a good time methinks.